I am always looking for quick tasty way to make veggies and change them up a bit. I like fancy but I don’t like “takes a TON of time fancy” meals. This oven roasted parmesan asparagus are a great side to any great meal. 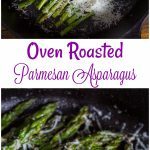 This Oven Roasted Parmesan Asparagus is very easy to make and takes little time also! It is one of my favorite side dishes to make and the whole house loves it! If you love asparagus then make sure you also check out this Lemon Roasted Asparagus! It is sooo good too! 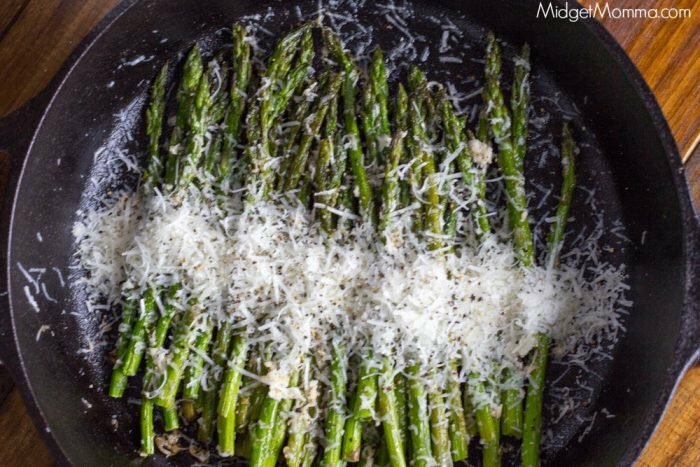 You can make this oven roasted Parmesan asparagus on a foil lined baking sheet, however I much prefer cooking it in my cast iron skillet. If you do not have one in your kitchen, I totally recommend getting one. They are seriously the best thing ever in the kitchen! Preheat the oven to 400 degrees. Trim the tough ends off the asparagus. 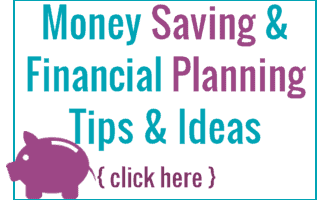 Place on a baking sheet lined with foil or in a cast iron skillet. Drizzle the asparagus with the olive oil. Sprinkle the asparagus with salt and pepper to taste. Sprinkle with the cheese and place back in the oven for 5 minute or until they are tender. Preheat the oven to 400 degrees. Trim the tough ends off the asparagus. Place on a baking sheet lined with foil. Drizzle the asparagus with the olive oil. Sprinkle the asparagus with salt and pepper to taste. Place in the oven for 10 minutes. Sprinkle with the cheese and place back in the oven for 5 minute or until they are tender.